Award honors local Italian-American community leaders who promote Italian culture. Dr. Jack Varsalona, president of Wilmington University, became the first recipient of the Rev. 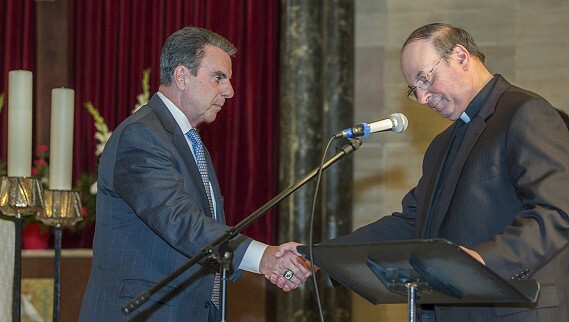 Roberto Balducelli Appreciation Award at Saint Anthony's of Padua church on June 8, 2014. He was presented with the new award by Rev. Nicholas Waseline of Saint Anthony of Padua Parish at the 12th Annual Gala Concert at the church on the first day of St. Anthony's famous Italian Festival in Wilmington. Dr. Varsalona was chosen as the recipient at this inaugural event because of his extensive work with the Italian-American Cultural Committee and support of the principles of the first Italian artisans to settle in the community: leadership, generosity and creativity. 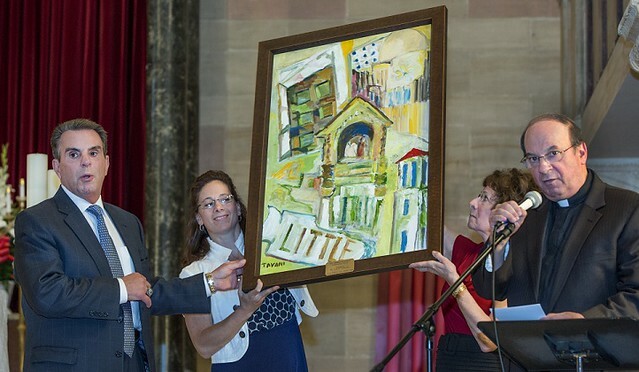 Saint Anthony's commissioned an original painting by highly-regarded local artist Michael Tavani as the first award to exemplify the work of Italian and Italian-American artisans. “Dr. Varsalona honors the principles of those artisans and, like Father Roberto, has shown tremendous dedication to Wilmington’s Italian-American community," said Rev. Nicholas Waseline of St. Anthony's Parish. "Others in our community benefit from his actions and his support, and Father Roberto's legacy lives on through his efforts." Father Roberto Balducelli died in 2013 on the eve of his 100th birthday. A vigorous and beloved figure in the Wilmington community, Fr. Roberto was considered a Renaissance man who created many works of art in addition to helping to build St. Anthony’s Church and continuing his influence for improvements at Padua Academy for Girls and the entire community for over 50 years. The award named in his honor will continue to recognize and show appreciation for local leaders in the Italian-American community who promote Italian culture. Saint Anthony of Padua Parish is a Roman Catholic community, located in Wilmington, Delaware, that is rooted in a tradition of dedicated, loving service to God and to each other. For more information, please visit stanthonynet.org. Wilmington University is a private, nonprofit university committed to providing flexible, career-oriented traditional and online undergraduate, graduate, and doctoral degree programs and offering small class sizes, individualized attention and affordable tuition. For more information, contact Wilmington University at 302-356-INFO (4636), via email at infocenter@wilmu.edu or visit our web site at www.wilmu.edu. Dr. Varsalona received the first Rev. Roberto Balducelli Appreciation Award at Saint Anthony of Padua's Italian Festival on June 8, 2014. Rev. Nicholas Waseline of Saint Anthony of Padua Parish presented the award to Dr. Varsalona at the gala concert on the first day of the Italian Festival in the Church of Saint Anthony of Padua.